Almost from the beginning of this movie, my overwhelming thought was, “I miss Robin Williams”. It’s no surprise that Williams, playing Army radio DJ Adrian Cronauer, is the star of the film overshadowing other terrific characters like Edward Garlick (Forest Whitaker — he’s so young in this film) and Lt. “Why-don’t-I-get-any-salutes” Hauk (Bruno Kirby). 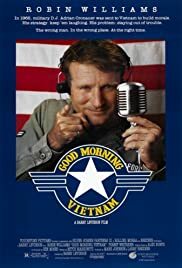 Cronauer is a role that is seemingly made for Williams and no one else could even come close to making Good Morning, Vietnam work just given his level of energy. But the other thing Williams always brings to his roles is a sense of humanity. It’s not just wall-to-wall laughs as a way to ignore what’s going on around you, Williams via Cronauer gets you to realize there is more. He befriends local Vietnamese people in Saigon and among his military colleagues you also witness moments of pure sincerity. One of the things you almost never realize about Williams’ comedy is that it comes from somewhere deep inside him. You barely notice because your distracted by the energy and the laughs, but part of all that is seeing the sadness too. Cronauer is outraged that he can’t report about a bombing at the local bar because it’s not “official news” so he reports that an explosive “unofficially” went off and “unofficially” wounded two soliders. It’s a powerful moment that really shows the gravity of the situation and the brilliance of Williams to so deftly bridge the funny with the serious. Without Williams, Good Morning, Vietnam wouldn’t be half as interesting as it is with him. That being said, it does feel like large parts of the film rely on him too heavily without charting their own course. Cronauer’s radio broadcasts are the focal scenes of the film, but the b-roll and other filler scenes feel like just that: filler. Unnecessary wouldn’t be entirely accurate — something needs to go over these scenes — but it feels like it could’ve been better tied together. Include more scenes like the one where Cronauer and Garlick run into the caravan of soldiers stopped on a road, or more scenes of the other radio DJs talking in the office about the goings-on in Vietnam. There’s several stories going on — the broadcasts, Cronauer’s English lessons, his relationship with Tuan and Trinh, and the top-brass trying to get Cronauer off the air — each great on their own, but could be tied together better. Good Morning, Vietnam is a great classic. A wonderful comedy in general, a great commentary about a part of the “conflict” in Vietnam that before now I hadn’t seen (i.e. military radio/troop downtime). It’s also a fantastic performance by Robin Williams, and others, that deserves its place in history. Well worth watching, if you haven’t seen it before, and if you have, perhaps give it a re-watch sometime soon.